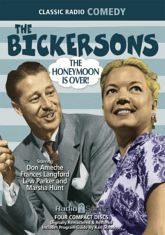 The Bickersons: The Honeymoon Is Over! In one corner�we have John Bickerson (played by Don Ameche and Lew Parker), the undisputed snoring champion of the world! In the other corner�we have Blanche Bickerson (played by Frances Langford and Marsha Hunt), radio's most relentless battle ax! Love conquers all? Well, we'll see about that. Listen in as radio's most contentious couple goes to the mat. The sleep-deprived are about to suffer the slings and arrows of outrageous matrimony in this cutting comedy. The Bickersons: Put Out the Lights!